May all who are free set others free. May all the world’s creatures obtain happiness. May all who are good be free from fear. May everyone see only good in this world. May everyone everywhere be glad. And long may our eyes see the sun. I am warm. Covered with a blanket, I lie horizontally and attempt to quiet my body as I activate my mind in an exercise called yoga nidra. It’s an hour-long guided meditation, the goal of which is to be physically still and detached while actively visualizing and reflecting internally. For an entire hour, I get to take my physical needs completely for granted, literally losing awareness altogether of my body. I emerge from the studio feeling grounded and refreshed, my priorities clarified and my mind settled. This is my little slice of heaven at the end of the day, a calming influence on my sometimes-stressful days here. I return home. We remark on how there’s too much food in the fridge and we should probably get rid of some of it. Self-consciously we back-pedal, acknowledging that this is a ridiculous thing to be saying. (I recall my father’s reminder not to waste the food on my plate: “There are starving children in Africa!” “But Daddy, we can’t send them this food!”) So-called “first-world problems” are funny when you’re removed from real suffering, but seem less comical when you come face to face with it. I go to sleep, my biggest concern that my internet has temporarily stopped working and I won’t be able to check my email until the next morning. We go on a Starbucks run, because a morning without caffeine seems unimaginable to us. 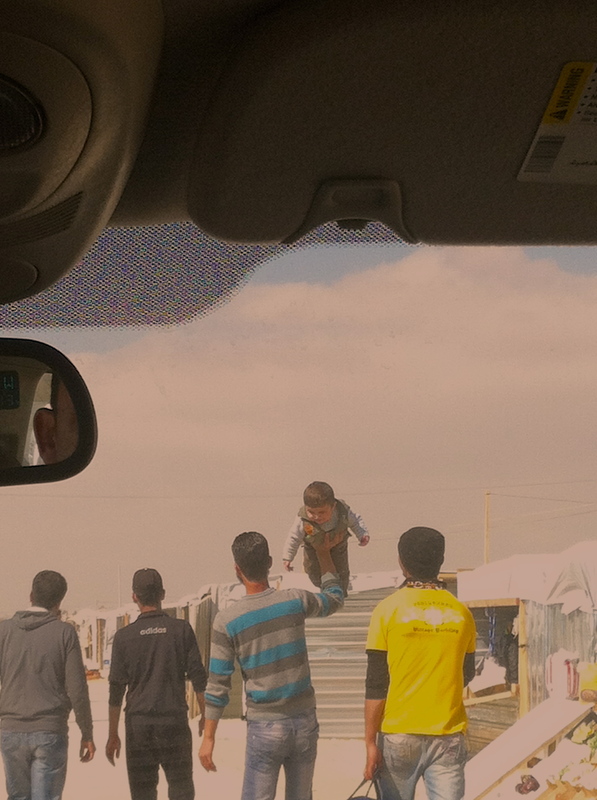 We gas up and drive an hour and a half north to Zaatari, by the Syrian border. We are on our way to the camp that is housing thousands of Syrians fleeing their homes. As I sip my latte along the bumpy road, I don’t know how to prepare myself for the hell I’m about to witness. 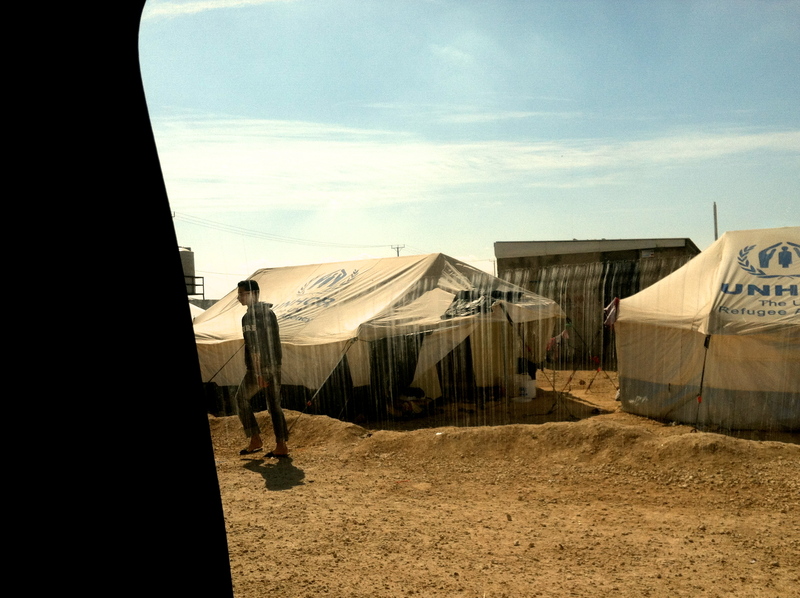 We arrive at Zaatari camp. 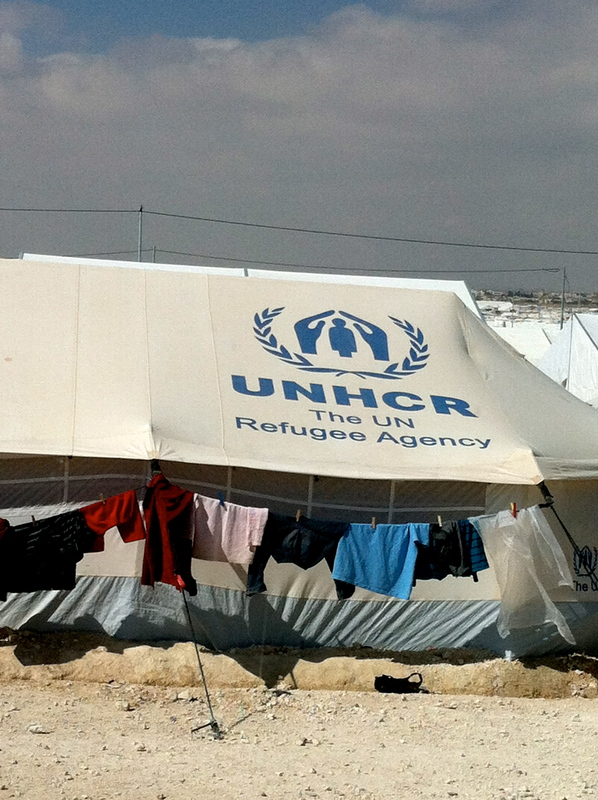 Of the estimated 350,000 Syrian refugees in Jordan, about 80,000 are residents of Zaatari, making it by far the largest of all the camps taking in those escaping the unending violence across the border. In the fall of last year, nightly arrivals were less than a thousand, but since January they have risen to 1500, to 2500, and now almost 3000 people every single night. The camp’s maximum capacity of 120,000 will shortly be exhausted. We are in a fenced-in area, beyond which is another fence, onto which a hoards of people are clinging. A few of the smallest children are sobbing, but most of the people in the group are just staring, pressed against the chain-link diamonds. Men sit on the ground, their backs against the fence, smoking and staring straight ahead. They have all apparently arrived last night. We drive around the camp to get a better sense of the space. An aid worker describes this tent city as “the wild wild west.” By this he means there is very little security or order. 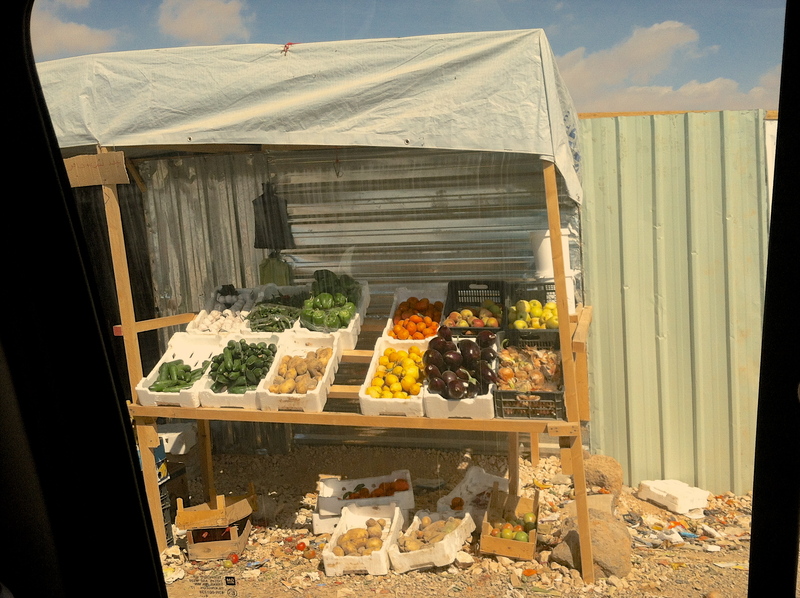 The Jordanian police stationed at Zaatari are mostly at the perimeter, unable to prevent rampant theft, organized crime, prostitution, and frequent stone throwing at aid workers. The residents are mostly left to fend for themselves. We see laundry hanging on lines connecting the thousands of white tents. Recently one tent burned down, and a 13-year-old boy died inside. The emergency response cannot easily navigate among the tents, which residents strategically move to be closer to the sole distribution point in the camp, complicating the rudimentary system of roads and tragically making the tent city almost impossible to navigate, especially in a big ambulance. The aid worker points out the corrugated metal shops that are springing up, where produce and cigarettes and candy are being sold. This semblance of normalcy is at once hopeful and distressing because of the permanency these shops indicate. Someone in the car suggests it’ll be six months tops before they start building for real. My mind flashes to images of Palestinian refugee “camps” where, after over decades and generations, tents have transformed into concrete cities, large ghettos that are quite permanent. With no end in sight for the violence inside Syria, the prospect of permanent buildings taking root here, too, seems inevitable. Little kids play in the dirt, staying close to their families’ tents. Their laughter and smiles contrasts the steeled look I’m sure is on my face. We arrive back in Amman, our Starbucks cups now empty and rolling around the bottom of the SUV. I discover some Lindt chocolate that someone has left at my desk. I don’t know what to do with myself. I feel guilty. I have a few hours at the office before yoga class. I struggle to make the mental transition from a lack of even bare-bones necessities to this self-indulgent, flighty practice of reflection and detachment. I am warm. Again, covered with a blanket for shavasana, I lie on a mat in a room full of strangers but feel safe. I attain some level of peace, if not fleetingly. 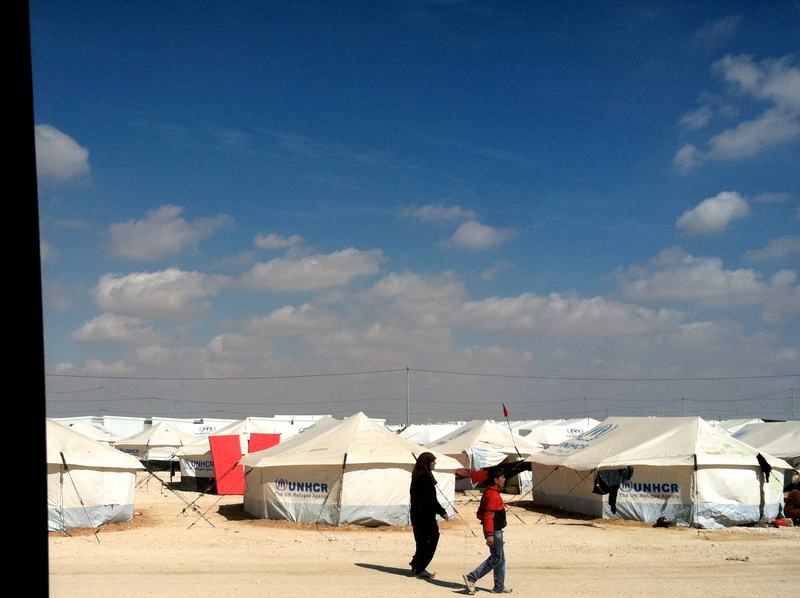 But I can’t reconcile my unimaginable privilege with the unbearably heartbreaking reality of Zaatari. I get to lie here and be much more concerned with the Maslovian concepts of self-transcendence and self-actualization than of my physiological or security needs. The idea of awareness that pervades the practice of yoga is now ironic to me: the residents of Zaatari are nothing if not aware of their situation. And my recent enlightenment is making me feel anything but settled. We say our last oms and head out into the night. This entry was posted in Uncategorized and tagged crisis, heaven, hell, humanitarian disaster, privilege, refugee, Syria, yoga, Zaatari. Bookmark the permalink. Again, a moving piece of writing. We think of you often out here on the rock. Hope to see you and see and hear more about all that you have done. I think it is good that you have the meditation time programmed into your day. I know that you are helping others and the time you take for yourself must surely help you to continue to do your best.